Manhunt 2 has finally been given an 18-certificate here in the UK. The British Board of Film Classification has lost its battle with the game’s publisher, Rockstar, over the game it tarred as being "sadistic, brutal and bleak." The Video Appeals Committee has announced that it has upheld the High Court decision to challenge the BBFC’s refusal to give the game UK classification. A cut-down version of the game will now be released with an 18 rating. “As I have said previously, we never take rejection decisions lightly, and they always involve a complex balance of considerations. We twice rejected Manhunt 2, and then pursued a judicial review challenge, because we considered, after exceptionally thorough examination, that it posed a real potential harm risk. 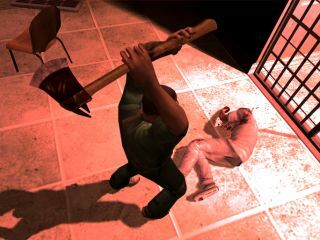 Rockstar and its many supporters have continued to stick to the line that Manhunt 2 is adult entertainment and should be considered by the BBFC on a par with mainstream horror films. "We are pleased that the VAC has reaffirmed its decision recognising that Manhunt 2 is well within the bounds established by other 18+ rated entertainment," Rockstar said in a statement. While gamers rejoice and the Daily Mail’s ‘outraged from Tunbridge Wells’ brigade gets itself in yet another lather with calls to ‘ban these evil games’, it’s nice to see that Rockstar’s lawyer is the voice of reason, summing up this long and sorry saga today. Lawrence Abramson, a partner at Rockstar’s lawyers, Harbottle & Lewis, claims that the current games ratings system needs rehauling. "The system works in films, but the gameplaying experience is different," he told The Guardian. Unfortunately, the BBFC was not available to comment further at the time of going to press.